Mineralogy[n 1] is a subject of geology specializing in the scientific study of the chemistry, crystal structure, and physical (including optical) properties of minerals and mineralized artifacts. Specific studies within mineralogy include the processes of mineral origin and formation, classification of minerals, their geographical distribution, as well as their utilization. Early writing on mineralogy, especially on gemstones, comes from ancient Babylonia, the ancient Greco-Roman world, ancient and medieval China, and Sanskrit texts from ancient India and the ancient Islamic World. Books on the subject included the Naturalis Historia of Pliny the Elder, which not only described many different minerals but also explained many of their properties, and Kitab al Jawahir (Book of Precious Stones) by Persian scientist Al-Biruni. The German Renaissance specialist Georgius Agricola wrote works such as De re metallica (On Metals, 1556) and De Natura Fossilium (On the Nature of Rocks, 1546) which began the scientific approach to the subject. Systematic scientific studies of minerals and rocks developed in post-Renaissance Europe. The modern study of mineralogy was founded on the principles of crystallography (the origins of geometric crystallography, itself, can be traced back to the mineralogy practiced in the eighteenth and nineteenth centuries) and to the microscopic study of rock sections with the invention of the microscope in the 17th century. More recently, driven by advances in experimental technique (such as neutron diffraction) and available computational power, the latter of which has enabled extremely accurate atomic-scale simulations of the behaviour of crystals, the science has branched out to consider more general problems in the fields of inorganic chemistry and solid-state physics. It, however, retains a focus on the crystal structures commonly encountered in rock-forming minerals (such as the perovskites, clay minerals and framework silicates). In particular, the field has made great advances in the understanding of the relationship between the atomic-scale structure of minerals and their function; in nature, prominent examples would be accurate measurement and prediction of the elastic properties of minerals, which has led to new insight into seismological behaviour of rocks and depth-related discontinuities in seismograms of the Earth's mantle. To this end, in their focus on the connection between atomic-scale phenomena and macroscopic properties, the mineral sciences (as they are now commonly known) display perhaps more of an overlap with materials science than any other discipline. Calcite is a carbonate mineral (CaCO3) with a rhombohedral crystal structure. Aragonite is an orthorhombic polymorph of calcite. 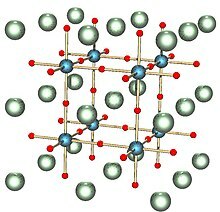 The perovskite crystal structure. The most abundant mineral in the Earth, bridgmanite, has this structure. Its chemical formula is (Mg,Fe)SiO3; the red spheres are oxygen, the blue spheres silicon and the green spheres magnesium or iron. Photomicrograph of olivine adcumulate, Archaean Komatiite, Agnew, Western Australia. In addition to macroscopic properties such as color or lustre, minerals have properties that require a polarizing microscope to observe. Systematic mineralogy is the identification and classification of minerals by their properties. Historically, mineralogy was heavily concerned with taxonomy of the rock-forming minerals. In 1959, the International Mineralogical Association formed the Commission of New Minerals and Mineral Names to rationalize the nomenclature and regulate the introduction of new names. In July 2006, it was merged with the Commission on Classification of Minerals to form the Commission on New Minerals, Nomenclature, and Classification. There are over 6,000 named and unnamed minerals, and about 100 are discovered each year. The Manual of Mineralogy places minerals in the following classes: native elements, sulfides, sulfosalts, oxides and hydroxides, halides, carbonates, nitrates and borates, sulfates, chromates, molybdates and tungstates, phosphates, arsenates and vanadates, and silicates. A new approach to mineralogy called mineral evolution explores the co-evolution of the geosphere and biosphere, including the role of minerals in the origin of life and processes as mineral-catalyzed organic synthesis and the selective adsorption of organic molecules on mineral surfaces. In 2011, several researchers began to develop a Mineral Evolution Database. This database integrates the crowd-sourced site Mindat.org, which has over 690,000 mineral-locality pairs, with the official IMA list of approved minerals and age data from geological publications. Access to such a database it possible to apply statistics to answer new questions, an approach that has been called mineral ecology. One such question is how much of mineral evolution is deterministic and how much the result of chance. Some factors are deterministic, such as the chemical nature of a mineral and conditions for its stability; but mineralogy can also be affected by the processes that determine a planet's composition. In a 2015 paper, Robert Hazen and others analyzed the number of minerals involving each element as a function of its abundance. They found that Earth, with over 4800 known minerals and 72 elements, has a power law relationship. The Moon, with only 63 minerals and 24 elements (based on a much smaller sample) has essentially the same relationship. This implies that, given the chemical composition of the planet, one could predict the more common minerals. However, the distribution has a long tail, with 34% of the minerals having been found at only one or two locations. The model predicts that thousands more mineral species may await discovery or have formed and then been lost to erosion, burial or other processes. This implies a role of chance in the formation of rare minerals occur. In another use of big data sets, network theory was applied to a dataset of carbon minerals, revealing new patterns in their diversity and distribution. The analysis can show which minerals tend to coexist and what conditions (geological, physical, chemical and biological) are associated with them. This information can be used to predict where to look for new deposits and even new mineral species. List of minerals – a simple list concentrating on minerals with Wikipedia articles. List of minerals (complete) – a more complete list of IMA-approved minerals, regularly updated. ^ "Mineralogy". American Heritage Dictionary. Houghton Mifflin Harcourt Publishing Company. 2017. Retrieved 19 October 2017. ^ a b "Mineralogy". Collins English Dictionary. HarperCollins Publishers. Retrieved 19 October 2017. ^ a b c Needham, Joseph (1959). Science and civilisation in China. Cambridge: Cambridge University Press. pp. 637–638. ISBN 978-0521058018. ^ a b c d e f g Nesse, William D. (2012). Introduction to mineralogy (2nd ed.). New York: Oxford University Press. ISBN 978-0199827381. ^ "Law of the constancy of interfacial angles". Online dictionary of crystallography. International Union of Crystallography. 24 August 2014. Retrieved 22 September 2015. ^ a b c Rafferty, John P. (2012). Geological sciences (1st ed.). New York: Britannica Educational Pub. in association with Rosen Educational Services. pp. 14–15. ISBN 9781615304950. ^ a b c d e f Klein, Cornelis; Philpotts, Anthony R. (2013). Earth materials : introduction to mineralogy and petrology. New York: Cambridge University Press. ISBN 9780521145213. ^ a b c d e f g h i j k Klein, Cornelis; Hurlbut, Jr., Cornelius S. (1993). Manual of mineralogy : (after James D. Dana) (21st ed.). New York: Wiley. ISBN 047157452X. ^ Sharp, T. (27 November 2014). "Bridgmanite – named at last". Science. 346 (6213): 1057–1058. doi:10.1126/science.1261887. PMID 25430755. ^ a b Ashcroft, Neil W.; Mermin, N. David (1977). Solid state physics (27. repr. ed.). New York: Holt, Rinehart and Winston. ISBN 9780030839931. ^ Dinnebier, Robert E.; Billinge, Simon J.L. (2008). "1. Principles of powder diffraction". In Dinnebier, Robert E.; Billinge, Simon J.L. Powder diffraction : theory and practice (Repr. ed.). Cambridge: Royal Society of Chemistry. pp. 1–19. ISBN 9780854042319. ^ Parsons, Ian (October 2006). "International Mineralogical Association". Elements. 2 (6): 388. doi:10.2113/gselements.2.6.388. ^ Higgins, Michael D.; Smith, Dorian G. W. (October 2010). "A census of mineral species in 2010". Elements. 6 (5): 346. ^ Scurfield, Gordon (1979). "Wood Petrifaction: an aspect of biomineralogy". Australian Journal of Botany. 27 (4): 377–390. doi:10.1071/bt9790377. ^ Christoffersen, M.R. ; Balic-Zunic, T.; Pehrson, S.; Christoffersen, J. (2001). "Kinetics of Growth of Columnar Triclinic Calcium Pyrophosphate Dihydrate Crystals". Crystal Growth & Design. 1 (6): 463–466. doi:10.1021/cg015547j. ^ Chandrajith, R.; Wijewardana, G.; Dissanayake, C.B. ; Abeygunasekara, A. (2006). "Biomineralogy of human urinary calculi (kidney stones) from some geographic regions of Sri Lanka". Environmental Geochemistry and Health. 28 (4): 393–399. doi:10.1007/s10653-006-9048-y. ^ Lowenstam, Heitz A (1954). "Environmental relations of modification compositions of certain carbonate secreting marine invertebrates". Proceedings of the National Academy of Sciences of the United States of America. 40 (1): 39–48. doi:10.1073/pnas.40.1.39. PMC 527935. ^ Amos, Jonathan (13 February 2016). "Earth's rarest minerals catalogued". BBC News. Retrieved 17 September 2016. ^ Hazen, Robert M.; Papineau, Dominic; Bleeker, Wouter; Downs, Robert T.; Ferry, John M.; et al. (November–December 2008). "Mineral Evolution". American Mineralogist. 93 (11–12): 1693–1720. doi:10.2138/am.2008.2955. ^ Hazen, R. M.; Bekker, A.; Bish, D. L.; Bleeker, W.; Downs, R. T.; Farquhar, J.; Ferry, J. M.; Grew, E. S.; Knoll, A. H.; Papineau, D.; Ralph, J. P.; Sverjensky, D. A.; Valley, J. W. (24 June 2011). "Needs and opportunities in mineral evolution research". American Mineralogist. 96 (7): 953–963. doi:10.2138/am.2011.3725. ^ Golden, Joshua; Pires, Alexander J.; Hazenj, Robert M.; Downs, Robert T.; Ralph, Jolyon; Meyer, Michael Bruce (2016). Building the mineral evolution database: implications for future big data analysis. GSA Annual Meeting. Denver, Colorado. doi:10.1130/abs/2016AM-286024. ^ Hazen, Robert M.; Grew, Edward S.; Downs, Robert T.; Golden, Joshua; Hystad, Grethe (March 2015). "Mineral ecology: Chance and necessity in the mineral diversity of terrestrial planets". The Canadian Mineralogist. 53 (2): 295–324. doi:10.3749/canmin.1400086. ^ Hazen, Robert. "Mineral Ecology". Carnegie Science. Retrieved 15 May 2018. ^ Kwok, Roberta (11 August 2015). "Is Mineral Evolution Driven by Chance?". Quanta Magazine. Retrieved 11 August 2018. ^ Kwok, Roberta (16 August 2015). "How Life and Luck Changed Earth's Minerals". Wired. Retrieved 24 August 2018. ^ Oleson, Timothy (1 May 2018). "Data-driven discovery reveals Earth's missing minerals". Earth Magazine. American Geosciences Institute. Retrieved 26 August 2018. ^ Hooper, Joel (2 August 2017). "Data mining: How digging through big data can turn up new". Cosmos. Retrieved 26 August 2018. ^ Rogers, Nala (1 August 2017). "How Math Can Help Geologists Discover New Minerals". Inside Science. Retrieved 26 August 2018. ^ Wilson, W (2013). "The Opening of the Mim Mineral Museum in Beirut, Lebanon". The Mineralogical Record. 45 (1): 61–83. ^ Lyckberg, Peter (16 October 2013). "The MIM Museum opening, Lebanon". Mindat.org. Retrieved 19 October 2017. Harrell, James A. (2012). "Mineralogy". In Bagnall, Roger S.; Brodersen, Kai; Champion, Craige B.; Erskine, Andrew. The encyclopedia of ancient history. Malden, MA: Wiley-Blackwell. doi:10.1002/9781444338386.wbeah21217. ISBN 9781444338386. Hazen, Robert M. (1984). "Mineralogy: A historical review" (PDF). Journal of Geological Education. 32: 288–298. Retrieved 27 September 2017. Laudan, Rachel (1993). From mineralogy to geology : the foundations of a science, 1650-1830 (Pbk. ed.). Chicago: University of Chicago Press. ISBN 9780226469478. Moses, Alfred J. (1918–1920). "Mineralogy". In Ramsdell, Lewis S. Encyclopedia Americana: International Edition. 19. New York: Americana Corporation. pp. 164–168. Oldroyd, David (1998). Sciences of the earth : studies in the history of mineralogy and geology. Aldershot: Ashgate. ISBN 9780860787709. Rapp, George R. (2002). Archaeomineralogy. Berlin, Heidelberg: Springer Berlin Heidelberg. ISBN 9783662050057. Wenk, Hans-Rudolf; Bulakh, Andrey (2016). Minerals: Their Constitution and Origin. Cambridge University Press. ISBN 9781316425282. Whewell, William (2010). "Book XV. History of Mineralogy". History of the Inductive Sciences: From the Earliest to the Present Times. Cambridge University Press. pp. 187–252. ISBN 9781108019262. Wikimedia Commons has media related to Mineralogy.